This article originally published in Gulfshore Business. Taste of Immokalee excerpt is copied below. 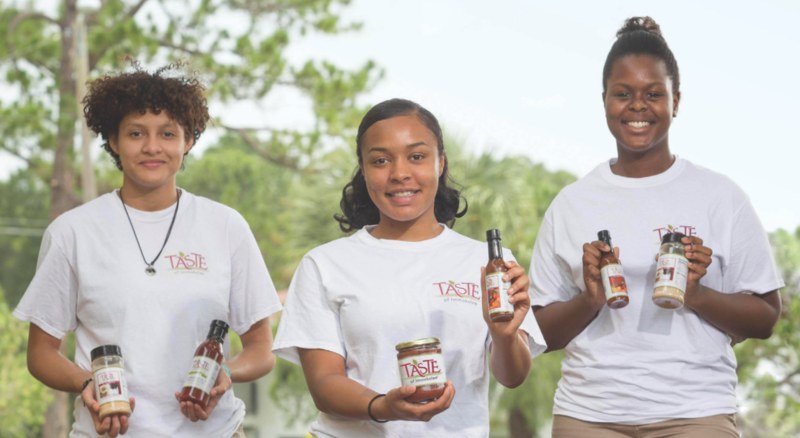 Taste of Immokalee produces salsa, sauces and spice rubs using local crops. But the real output is of the human variety—the development of young leaders, carefully cultivated from the rocky soil of poverty and its limitations. The company was the brainchild of 16 Immokalee High School students who three years ago decided to use their community’s bounty to celebrate its cultures and to give students an opportunity to learn entrepreneurship firsthand. Education was everything to these teens, mostly immigrants or first-generation Americans whose parents toiled in fields and packinghouses so that their children might enjoy more prosperous futures. The Immokalee-based One by One Leadership Foundation provides funding with the expectation that the company eventually will become a self-sustaining, for-profit firm anchored by its social mission. The Tamiami Angel Investment Fund, in a first for its investors, recently set up a funding mechanism through the Community Foundation of Collier County to support the students’ leadership development. Taste of Immokalee products are sold at Publix supermarkets throughout Collier, at Wynn’s Market in Naples and online. The Collier County School District uses its hot sauces in school lunch recipes. This past summer marked a reboot for the company, which is in a constant churn of incoming and outgoing students. The newest crop of young business people was charged with a number of big tasks, including developing new products. The adult advisers pushed for a kind of social development, too, inviting for the first time young people from Naples to join their peers in Immokalee. “For me, it’s an opportunity to learn about business and to give back,” says Johanson Vilsaint, who started at Santa Fe College this year. “We’re known as the second- poorest city in Florida, but we’re not just taking that stat and accepting it. We’re doing something about it.” Slusar and Marie Capita, the executive director, are working to write a curriculum that other communities can use to replicate Taste of Immokalee’s approach. “There are problems in our communities right now, and business can’t solve it. Government can’t solve it. Not-for-profits can’t solve it. The only way they can be solved, in our opinion, is if they work together. We think we have a good model for doing that,” Slusar says.